This Week: Blue Chip Matchmaker and George Morton Levy series finals and consolations, Yonkers Raceway, Yonkers, N.Y. Schedule of events: The Grand Circuit at Yonkers this week features the $662,800 final and the $100,000 consolation of the George Morton Levy series for open pacers, as well as the $401,600 final and $75,000 consolation in the Blue Chip Matchmaker series for open pacing mares. All four races will take place on Saturday (April 20). Complete entries for the races can be found by clicking on this link. Last time: Ideal Jimmy and Western Fame have raced with distinction throughout the George Morton Levy Memorial Pacing Series. Saturday night (April 13) was no exception. 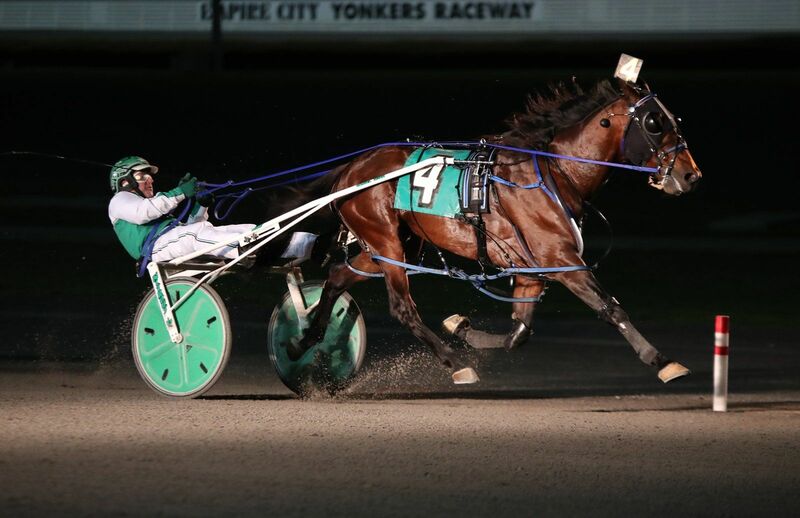 The tandem each handily won their respective Yonkers Raceway event. All told, four $50,000 Free-For-All forays were carded. Western Fame added another victory to his Levy Series resume. Mike Lizzi photo. Odds-on Western Fame (Dan Dube, $2.30) — from post position four — stole a cheap second subsection (:27, :56.2, 1:24, 1:51) en route to victory. He disposed of a gallant Rodeo Rock (Andy McCarthy) by 1-3/4 lengths. That one tried to leave, was forced to settle third, then fought the good, first-up fight into a :54.3 back half. More The Better N (Scott Zeron), Pacing Major N (Jordan Stratton) and Endeavor (Jason Bartlett) picked off the small change. Western Fame, a 6-year-old son of Western Ideal owned by Go Fast Stable, B & I Stables, Stephen Klunowski and Gilbert Short and trained by Rene Allard, is now 4-for-6 this season (4-for-5 in the Levy). At no point in the eight furlongs did Ideal Jimmy (Brent Holland, $5.60) look anything except the easiest of winners. From post position six, he aired (:27.2, :57.1, 1:25.1, season’s-best 1:52) by open lengths, while under severe restraint. Ideal Jimmy took down Ballerat Boomerang (Tim Tetrick) by 3-1/2 lengths. Rockin Ron (Matt Kakaley) was third after missing four weeks, with a pocket-tiring, 7-5 choice Anythingthingforlove A (Joe Bongiorno) and Somebaddude (George Brennan) also earning appearance coin. For second choice Ideal Jimmy, a 6-year-old son homebred Western Ideal gelding owned by D R Van Witzenburg and trained by Erv Miller, it was his sixth win in 13 2019 tries (3-for-5 in Levy). Complete recaps of the weekend races are available at the Grand Circuit website. Grand Circuit Standings: In 2019, the Grand Circuit leaders in three categories (driver, trainer and owner) will once again be tracked on a points system (20-10-5 for the top three finishers in divisions/finals and 10-5-2 for the top three finishers in eliminations/legs). Winbak Farms is the sponsor for the 2019 Grand Circuit awards. Drivers: 1. Tim Tetrick – 126; 2. George Brennan – 90; 3. Jason Bartlett – 77; 4. Scott Zeron – 68; 5. Matt Kakaley – 63. Trainers: 1. Jim King Jr. – 82; 2. Rene Allard – 57; 3. Ron Burke – 53; 4t. Tony Alagna – 41; 4t. Richard Banca – 41. Owners: 1. D R Van Witzenburg – 40; 2. Brad Grant – 34.3; 3. Robert Cooper Stables – 32.8; 4. Jo Ann Looney-King – 30; 5. J L Benson Stables – 27.5. Looking ahead: Grand Circuit action will take place next weekend at Freehold Raceway, with $40,000 (est.) Dexter Cup eliminations (if necessary) for 3-year-old open trotters on Saturday (April 27).